The Asics Gel Fortius TR 2 for men is made specifically for those in high-intensity interval training (HIIT). HIIT provides strength and aerobic workouts using a variety of exercises with rotating intervals of activity and rest. The unending list of possible exercises include walking, running, rowing, stair climbing, planking, blurpees, squats, high knees, crunches, lifting and kicks. All involved fast and intense movements. Yet, Asics claims to have made the Asics Gel Fortius TR 2 to withstand all the stress a HIIT workout can bring. The durability starts with a high traction, high abrasion-resistant rubber for the outsole, according to Asics. It provides cushioning and quality grip on wet and dry surfaces. The next step to create the Asics Gel Fortius TR’s level of resilience is to provide an abrasion resistant double stitched quarter panel and medial. The RhynoSkin rubber reinforced toe cap, strengthened further by a synthetic leather, increases not only the durability of the toe but the all of the upper on the Asics Gel Fortius TR 4. But, lets not forget it also gives added protection for the toes from protruding or falling objects. 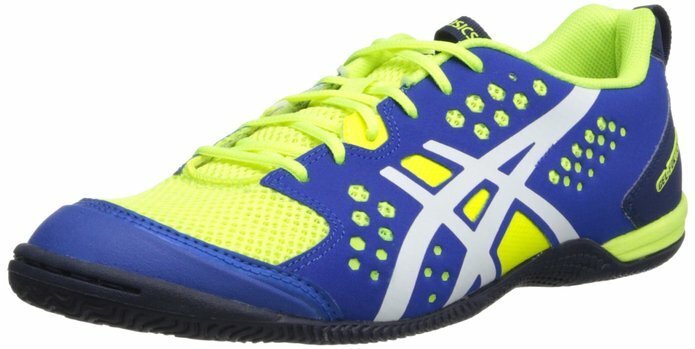 Asics also describes the Asics Gel Fortius TR 2 as having a low profile platform that provides support and stability during the rigors of an HIIT WOD. The double stitched quarter panel sustains the foot’s position during turns, lateral and side-to-side moves. The stability does not compromise the comfort because the Gel Cushioning is in place to absorb shock, especially the rearfoot during heel strikes. The AirMesh upper allows the Gel Fortius TR 2 to fit snuggly but also allows expansion if the foot swells during a workout and allows the foot to breath. The tongue, also made of AirMesh, allows more air to flow, keeping the foot dry and odor to a minimum. This lace up shoe has three color choices including flash yellow with white and royal blue highlights, black with flash yellow and silver highlights and graphite with black and true red highlights. Reviews state the shoe’s fit is tight but comfortable. Several people described the Asics Gel Fortius TR 2 as lightweight (only 9.9 oz.) and durable. Yet, they did state the shoe needs some breaking in before the most comfort is obtained. One review went as far as to describe the shoe as fitting the form of your foot and as taking away all the extras to provide your foot with an interactive experience with the ground, as if walking barefoot. The overwhelming criticism from reviewers is that the cross trainer is narrow so consider getting a half to whole size larger if your foot is wide. Review the best Crossfit Shoes for Men in 2018.